HÔN is a remarkable new artist that challenges the conventions of pop music and serves an abundance of insanely catchy songs on the forthcoming debut album White Lion. It is an album that elegantly combines the songwriting-virtues of classic pop with an indie musician's awkwardly charming take on R&B, dance and 80er melancholy. “Honeydream” follows the introductory track “Silent Lover” that premiered earlier this summer at the405. 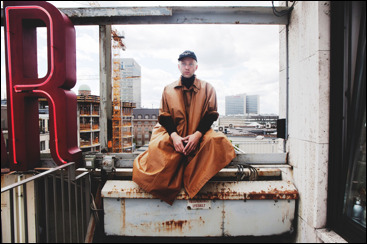 HÔN is a pop mashup; it’s Danish songcrafter Jesper Lidang's exploration of the harmonious & eloquent vs the raw & edgy in the same musical movement. If the name Jesper Lidang rings a bell it’s probably because of his role as frontman of Danish band The Rumour said Fire. “Honeydream” shows the talents of Jesper Lidang. An extremely melodic and catchy melancholic chorus surrounded by the beat driven verse. “Honeydream” expresses HÔN’s universe of 80’s drummachines, layers of voices and the catchy melody in a creative and edgy production by Nis Bysted. All songs are recorded and sung by Jesper alone. Nis Bysted (producer of Iceage, Cancer, Lower, and Liss) has produced and mixed HÔN together with Jesper and the result is a powerful signature-sound where you can either plunge into the musical deep or let your body move to the music – or do both.